Wall murals for corporate offices need to meet certain criteria. 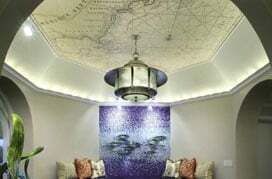 Not only must these murals complement the ambience and settings within the office, they must also often serve as conversation sparkers and icebreakers in a waiting area or conference room. Our collection of corporate office wall murals includes murals depicting high-rise buildings that house offices in bustling cities as well as landscapes, sceneries, portraits, still life and other types of photographs and art appropriate for display in corporate settings. So, whether you’re looking for murals of corporate offices or a mural for your corporate office, this is the place to find one. Wallpaper murals play an important role in breathing life into what might otherwise be a stark environment. You may not always be able to control the design and architecture of your workplace settings but with the simple addition of a wall mural, you can transform any hallway, lobby or meeting room into a lively, inviting space. Murals featuring nature’s spectacular sights, famous monuments, aerial views of cities, cityscapes, bridges, towers and other manmade and natural settings help create a focal point. 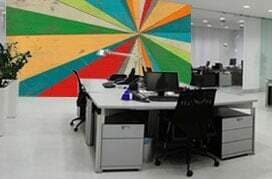 On the other hand, if you’d much rather prefer wall decor that does not overwhelm but simply enriches the interior decor in your space, our abstract corporate office wallpaper murals can do that too. With corporate office wall murals, impact depends on placement and scale. In small lobbies or offices, a wallpaper mural of a picturesque landscape can serve as an artificial window and open up the space. In a long hallway or a stairway landing, a wallpaper mural of a famous personality or monument serves as a reflection of your company’s values and to an extent, the brand personality you wish to project. Regardless of industry, location and other factors that may define your corporate office’s interior design, our collection of wall murals helps break barriers and sets new standard in creative office space decor.